The Mark 84 or BLU-117 is an American general-purpose bomb. It is the largest of the Mark 80 series of weapons. 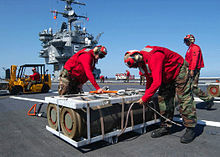 Entering service during the Vietnam War, it became a commonly used US heavy unguided bomb (due to the amount of high-explosive content packed inside) to be dropped. At the time, it was the third largest bomb by weight in the US inventory behind the 15,000 pounds (6,803.9 kg) BLU-82 "Daisy Cutter" and the 3,000 pounds (1,360.8 kg) M118 "demolition" bomb. It is currently fifth in size due to the addition of the 5,000 lb (2,268.0 kg) GBU-28 in 1991 and 22,600 lb (10,251.2 kg) GBU-43/B Massive Ordnance Air Blast bomb (MOAB) in 2003. The Mark 84 has a nominal weight of 2,000 lb (907.2 kg), but its actual weight varies depending on its fin, fuze options, and retardation configuration, from 1,972 to 2,083 lb (894.5 to 944.8 kg). It is a streamlined steel casing filled with 945 lb (428.6 kg) of Tritonal high explosive. The Mark 84 is capable of forming a crater 50 feet (15.2 m) wide and 36 ft (11.0 m) deep. It can penetrate up to 15 inches (381.0 mm) of metal or 11 ft (3.4 m) of concrete, depending on the height from which it is dropped, and causes lethal fragmentation to a radius of 400 yards (365.8 m). Many Mark 84s have been retrofitted with stabilizing and retarding devices to provide precision guidance capabilities. They serve as the warhead of a variety of precision-guided munitions, including the GBU-10/GBU-24/GBU-27 Paveway laser-guided bombs, GBU-15 electro-optical bomb, GBU-31 JDAM and Quickstrike sea mines. The HGK is a Turkish guidance kit used to convert 2000-lb Mark 84 bombs into GPS/INS guided smart bombs. According to a test report conducted by the United States Navy's Weapon System Explosives Safety Review Board (WSESRB) established in the wake of the 1967 USS Forrestal fire, the cooking off time for a Mk 84 is approximately 8 minutes 40 seconds. In March 2016, a Saudi coalition struck a Yemeni market -- reportedly with a US-supplied precision-guided Mk 84 bomb -- killing 97 people. ^ a b "Mk84 General Purpose Bomb". Federation of American Scientists. 23 April 2000. Retrieved 1 September 2010. ^ "Fiscal Year 2011 Budget Estimate Procurement of Ammunition" (PDF). US Air Force. Archived from the original (PDF) on 20 April 2012. Retrieved 29 December 2011. ^ Don, Holloway (March 1996). "STEALTH SECRETS OF THE F-117 NIGHTHAWK: Its development was kept under wraps for 14 years, but by 1991, the F-117 nighthawk had become a household word". Aviation History. Harrisburg, Pennsylvania: Cowles Magazines. ISSN 1076-8858. ^ "Mk 65 Quick Strike Mine". Federation of American Scientists. 8 December 1998. Retrieved 1 September 2010. ^ "Precision Guidance Kit (HGK)". TÜBİTAK-SAGE. 2013. Retrieved 28 February 2016. ^ CNN, Nima Elbagir, Salma Abdelaziz, Ryan Browne, Barbara Arvanitidis and Laura Smith-Spark,. "Bomb that killed 40 children in Yemen was supplied by US". CNN. Retrieved 2018-08-18. This page was last edited on 18 March 2019, at 10:33 (UTC).